Maybe I chose this recipe because I call my daughter Angel Pie. I don’t know, but it sounds delicious and I will have to find an excuse to make it one of these days. This is reminiscent of pavlova, which my friend who spent a year in Australia introduced to me. She makes the best pavlova! Pavlova is a meringue crust with whipped cream topping and although it looks intimidating, it’s very easy. Anyway, this is also a gluten free food for those who want it, and it looks like a wonderful dessert. 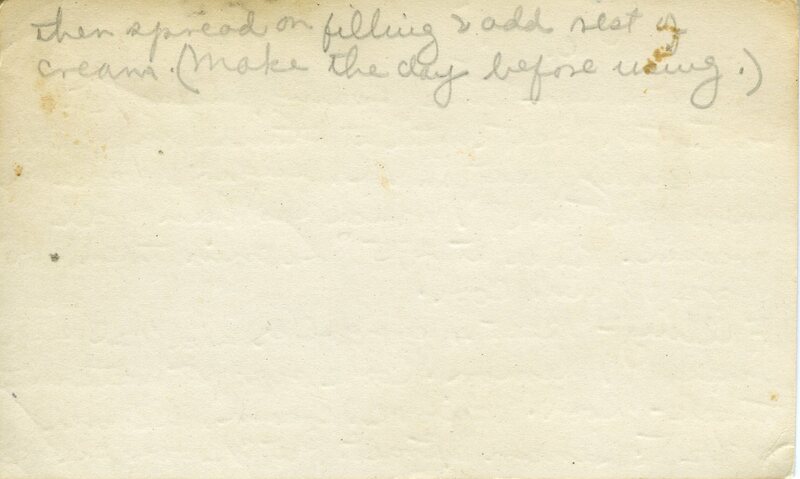 The recipe was written in pencil and yes it is difficult to read as it has faded over time. 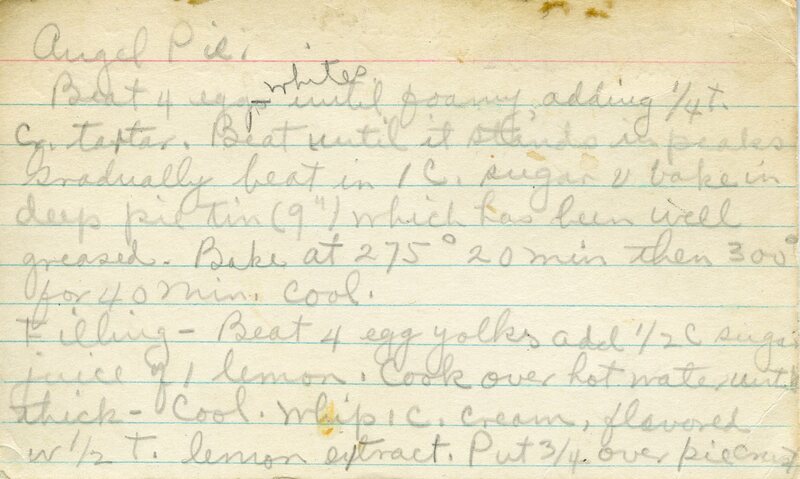 I don’t know if Gram made this pie with an electric mixer or not. I can’t imagine how long it would take to whip the eggs until they stood in peaks by hand. If you use an electric mixer, you should whip it quite a while. My friend also noticed recently that when she used a straight-sided bowl, her egg whites didn’t fluff up as much as when she used a bowl with sloping sides and a wider opening. It could be because more air was able to be infused into the egg whites with the wider bowl. I don’t know, but take that with you as you go into battle, so to speak. Secondly, about whipping cream…what is most available in the store these days is ultra-pasteurized heavy whipping cream. Some people feel this has a more metallic taste due to the extra processing for longer shelf-life. If you are able to find pasteurized heavy whipping cream, it tends to whip faster and have a more creamy taste. It’s not as processed. Put your metal bowl and mixer whisk into the freezer before whipping for optimal results. Beat 4 egg whites until foamy, adding 1/4 t cr. tartar. Beat until it stands in peaks. Gradually beat in 1 c sugar & bake in deep pie tin (9″) which has been well greased. Bake at 275 20 min then 300 for 40 min. Cool. Filling – Beat 4 egg yolks, add 1/2 c sugar, juice of 1 lemon. Cook over hot water until thick – cool. Whip 1 c. cream, flavored w/ 1/2 t lemon extract. Put 3/4 over pie crust then spread on filling & add rest of cream. Make the day before using. This was probably my most favorite desert as a kid. When we were given the treat of choosing a desert because of good grades, birthdays etc. this was my first choice. I never wanted to be bothered with all the fuss to make it – plus all the calories it contained. As a kid, I never thought about calories, I “ran” them off. Oh, and by the way she probably used her mixer, she got one rather early on, I think from Grandma Sternberg when she moved in with us when I was in 8th grade.